About four years ago, I discovered a practice that I’ve fallen in love with as it’s helped me feel more present in my own life. It’s the practice of keeping track of what I’m learning – from the serious, the sacred, the silly or the just plain useful. Many of you have joined me in looking back before we move forward. Doing it together makes it more fun. So this is your handy guide to help you know what to track, how to track it, and when to link up with us here. One of the comments I get from people most often is that they keep meaning to join us but they can’t think of one thing they’ve learned. The problem isn’t they aren’t learning. The problem is they aren’t keeping track. Personally, writing is how I know what I think about things. But tracking what I’m learning helps me understand who I’m becoming. One way to decide what you should keep track of is to go back in your mind to the end of each year. What do you tend to think about right before the turn of a new year? think ahead into the next year to make goals and cast vision? reflect about family or relationships? wish you could remember insights from books you read? feel discouraged about your lack of progress on certain projects? When you think about the way you reflect at the end of the year, this will help to inform the types of thing you may want to track as the year goes by. This will be a useful tool for you — instead of trying to reflect on an entire year at once by pouring over long-form journals or trying to remember where to find that quote from that book you read last February, you can simply pull out your simple lists of what you were learning as you learned it rather than trying to remember after the fact. When I learn something new or interesting about a family member ex: My grandfather joined the war five days before the attack on Pearl Harbor. My kids say or do something surprising, funny, or thoughtful that I don’t want to forget ex: Luke has started writing raps and it’s fantastic. What’s life-giving and what’s life-draining when it comes to my work. ex: I love to teach webinars. Who knew? Insights I have about the work I’m doing. ex: Creative work no one knows about is hard work to finish. When I learn how to do something new that I’ve never done before. ex: I launched my first online course! A moment worth celebrating ex: One of my books released in Dutch! Something I want to get better at. ex: I’m learning how to rest and it’s ironically hard work. Relational interactions I realize I want to change or improve. ex: I’m not a great initiator. Favorite shows and movies. ex: This Is Us makes me feel better about the world. Shoes and clothes that work well. ex: I found my favorite shoes for airplane travel! Stuff my phone can do that I never knew was possible ex: Holding down your finger on the screen of an Instagram story will pause the video. What?! Recipe short cuts and/or new family favorites. ex: My daughter is obsessed with enchiladas. Make these more often! My doctor is married to my news anchorman. True story! Fun celebrity facts ex: Keifer Sutherland has a twin sister. Interesting tidbits about history or public figures. ex: The First Family pays for their own food bill. Things I learn about myself ex: The most difficult person to be kind to is me. Things I learn about God ex: Instead of a map, God offers me his hand. And on it goes. Our lives are lived in our everyday moments and this is the best way I’ve found to hold those moments, learn what they have to teach, and move forward with a lighter heart. Some of these things are more serious or important than others, but keeping them all on one list helps to remind me how life has many colors and depths and I do best when I am willing to hold them all together, sacred and silly alike. Those are some examples of what to track. Now here’s some tips on how to track them. When it comes to keeping track of what I’m learning, simple is good and right and just my style. This is my third year using a bullet journal. If you’ve never heard of that (Is that possible? Seems like everyone is talking about it these days!) it isn’t a specific journal. It’s a note taking system created by Ryder Carroll. 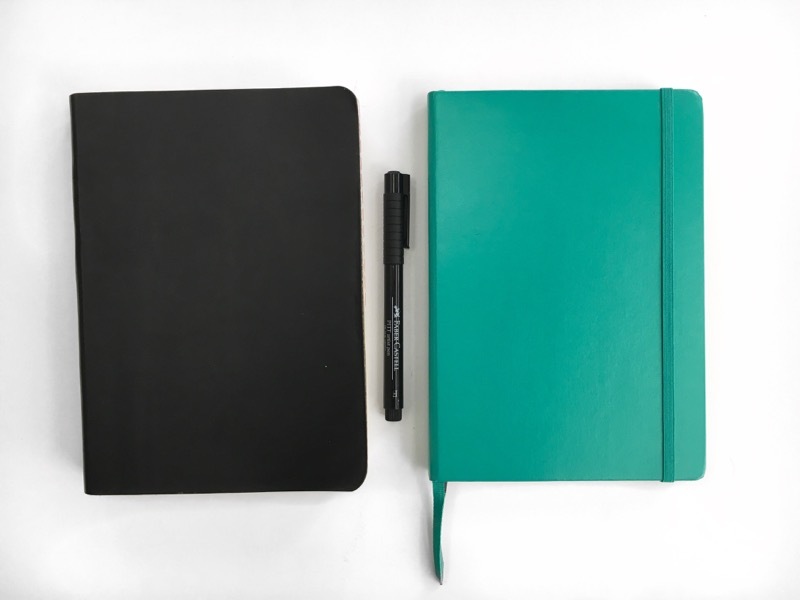 For the past two years I’ve used this Miquelrius soft bound journal with graph paper lines but this year I’m trying the Leuchtturm 1917 with dots (I have the Emerald one but the others less expensive) although you can use any journal you like. Here’s the Miquelrius on the left, the Leuchtturm on the right. And if you’re anything like me, you want to know what the actual pages look like, so here’s a peek inside (Miquelrius is the graph and the Leuchtturm is the dots). The way I keep track of what I’m learning is simple. I make my to-do list for the day with the date at the top of a page in my bullet journal. 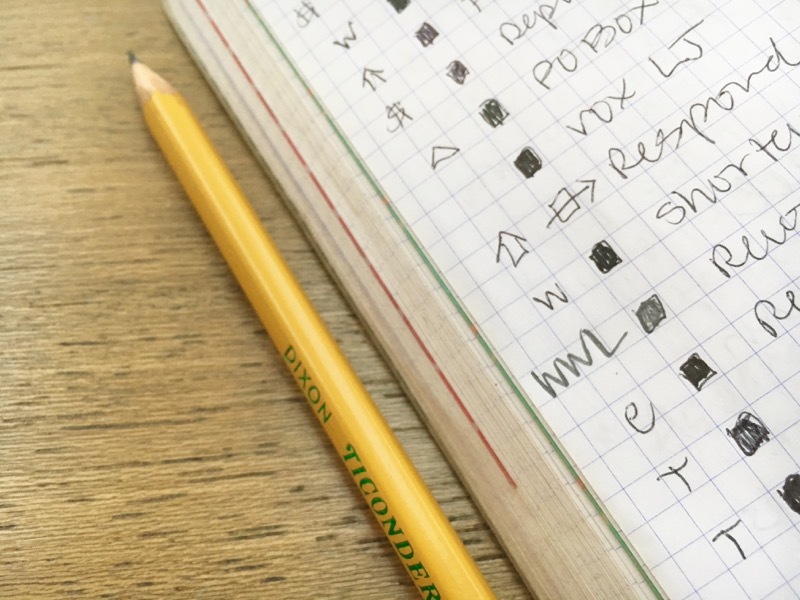 As something comes to mind, I simply mark it down on my to-do list with a WWL signifier (WWL = What We Learned). This is how I kept track for years in my bullet journal. Sometimes they might not make sense to someone else reading them, but typing them up for the blog is a great way to elaborate and explain them. Whenever I share my own lists, I host a link up here on the blog to invite you to share your own lists. I used to do this every month, but late last year I made an important change to my system. Last year, I started paying attention to how I most prefer to plan and vision for my work and my life. 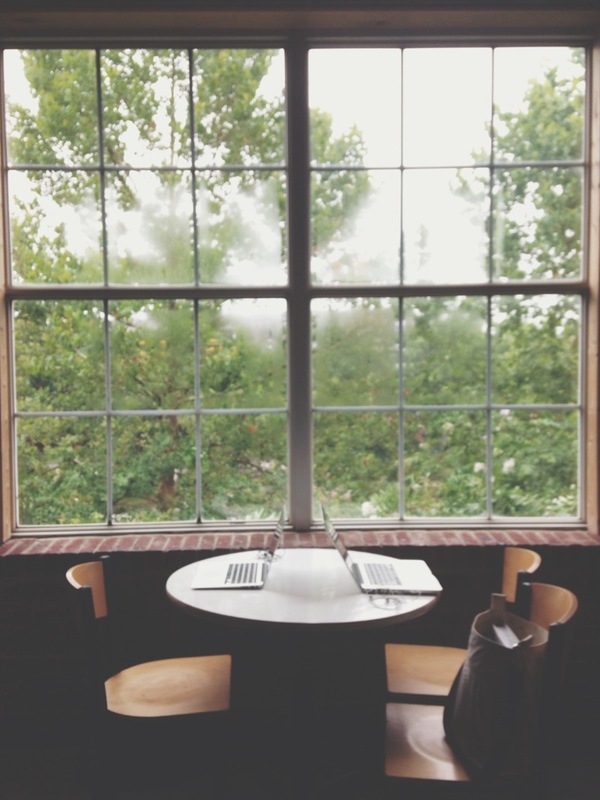 I realized that at the end of each month, I often felt pressured to come up with something meaningful I was learning. I struggled to sum up deeper thoughts or reflections that take longer than 30 days to sink in. But I already knew I couldn’t wait until the end of the year to consider what I’ve learned – that’s too long. By the time I sit down to think over the past year in December, it’s hard to remember October, much less what happened way back in February. I thought about how often times the more serious things I’m learning tend to go along with the seasons. Themes of waiting and listening in the dark tend to rise to the surface during Advent. 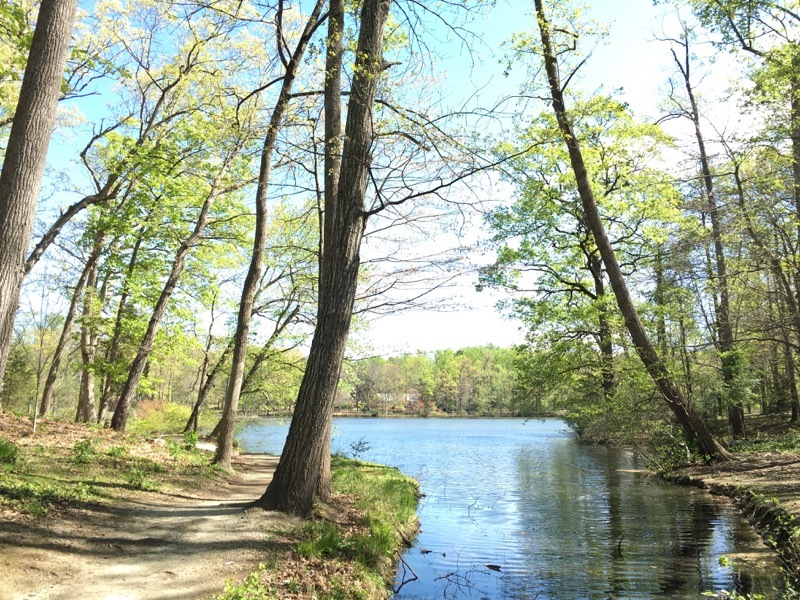 Themes of growth and new life emerge in spring. You see how this is going? If it’s good enough for nature, it’s good enough for me. The three month span of time has become one of my favorite ways to plan and, in turn, my new favorite way to record what I’m learning. Around the end of each season, I gather up my list and share it with you here, always happy to invite you to share yours as well. If you use the bullet journaling system, I hope I’ve inspired you to add a new page to it called What I’m Learning. And at the end of the season, you can share your list with us! Whether you use a bullet journal or not, I have something I hope will make it easier for you to track what you’re learning each season. It’s a printable list, one for each season. And if you are in the Southern Hemisphere, we didn’t forget you! Even though it blows my mind that the seasons are opposite in the two hemispheres, we wanted to make sure there is a collection for you no matter where you live, so this download includes seasons for each hemisphere with the months to match. There are also two sizes – a full page size and a half page that fits nicely within a journal. I just washy-taped it right in there onto my journal page and love it so much. 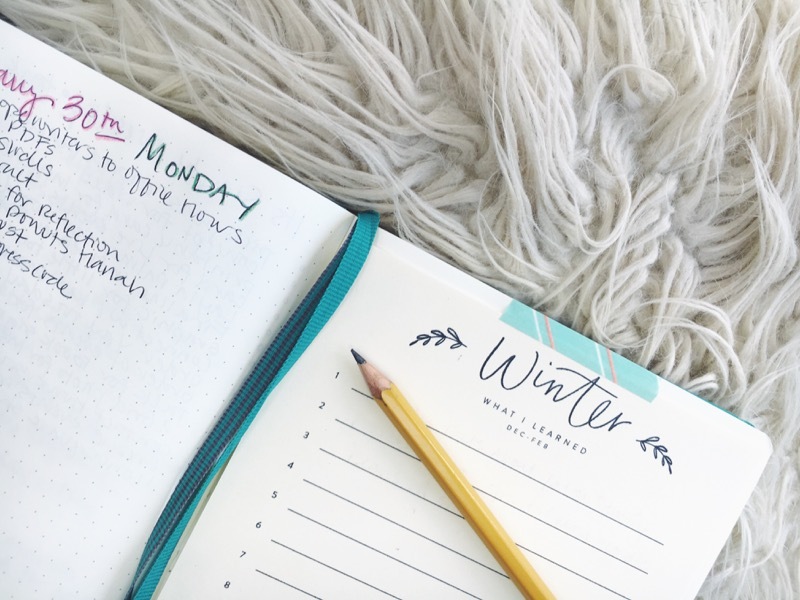 We still have one month left before we share our What I Learned posts at the end of February, so I hope these printables can be that extra support you need to start keeping track today. Just scroll down to enter your email so we can deliver your lists. The soul is often forgotten beneath the demands of everyday life. It’s easy to get tangled up in a fast-paced world, distracted by hustle, driven to produce, hungry to ship. One way to slow the hustle is to practice paying attention to your own life. 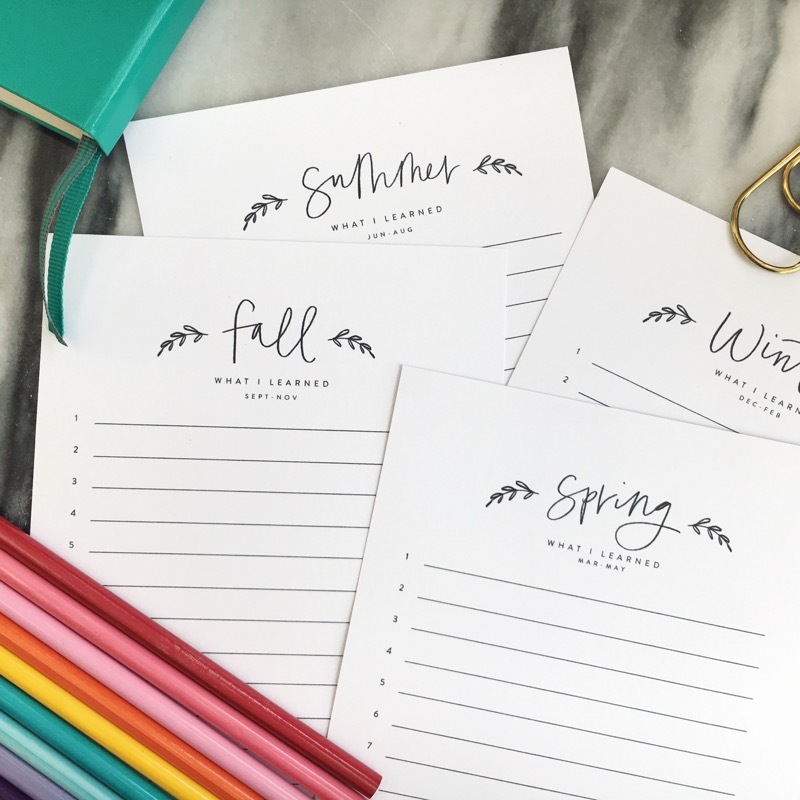 Sign up here to receive your printable lists to help you keep track of what you're learning - one for each season of the year. Note: You will receive both Northern and Southern Hemisphere options in your download, so be sure to print out the appropriate one. Add them to your calendar so you don’t forget to come share your lists with us! Emily, this is so helpful. I learned the spiritual discipline of paying attention from you several years ago and it continues to transform my life. I have a running document on my computer of things I learn, but putting it into my bullet journal makes so much more sense. Thanks for the lovely printable! Thank you, Emily, for this lovely, simplistic tool! 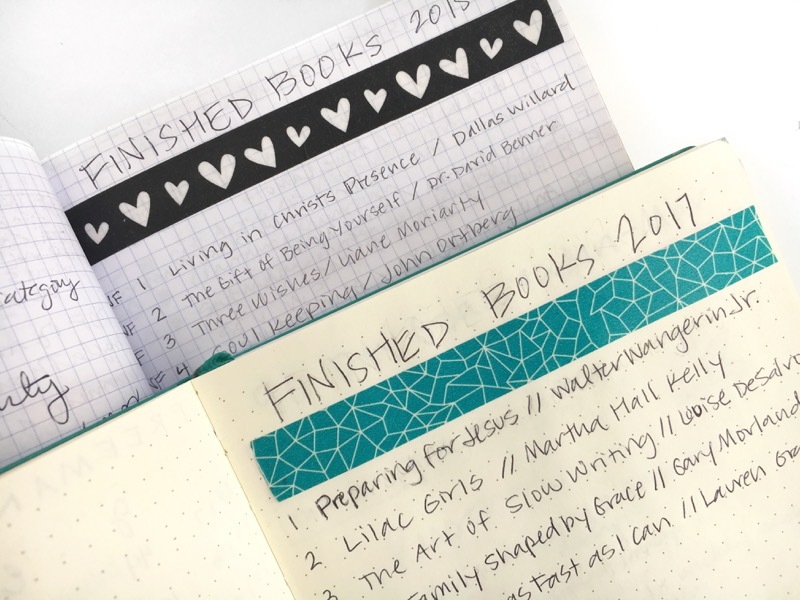 As a fellow bullet journaler and list maker, I can’t tell you how much I love this post. I always want to join in the “What I learned”, and i never think to write the stuff down. Mostly because, I am not paying enough attention and I haven’t made space for it. Thank you. Just love! It turned out SO BEAUTIFUL!!! I love it all! The light coming form garden is awesome! I love the way your brain works and how you share 🙂 Yes, this download will be very helpful in keeping track. I’m wondering if bullet journaling would help me, but I’m scared since I jot my morning pages and devotional responses into the same space and that works nicely but then my to-do’s and goals get kind of lost. Ahh! Thank you, Emily. I just learned that there is something called a “bullet journal”. I am a list maker and I journal so I am excited to use this tool to help me remember all that God is teaching me. Fabulous post! Valuable information re paying attention/learning and the tracking tips are SO helpful. Thank you for the printables too, they’re awesome! Wow wow, I love this! I’ve taken to keeping notes and to-do lists in my agenda this year because that’s something I never lose track of and take with me everywhere . . . but I love the idea of incorporating bullet journaling into that and using these lists to brighten up my space! Thanks for the ideas Emily! You should only eat oysters in months that *end* in -r! April, February, etc still not the greatest for those filtering sea creatures! ha! That’s a good distinction. I think I actually did learn it that way but wrote it wrong here. Thanks! MY son Luke just started writing raps, too, and it IS fantastic!!!! Lots of great ideas for my bullet journal – thanks for sharing. This is Us makes me feel better about the world, too 🙂 I am trying to learn the bullet journal thing and really loving it! thanks for your ideas! Inspired! New elements are welcome to my system! Thank You! Grateful! Is this the only journal/log you use for everything? Book reading, Bible Lessons, workshops you attend, Sermaons, etc??? It seems I have too many…. specific meetings, women’s study group, messages/sermons, reading notes for Bible Study…????? That is why I am wondering if one journal is all you use( then when that is full, go onto another? )which would bring simplicity, peace, no confusion which of course what this is all about in your post. Ok. Clarified question! Reading back up through comments and thought I’d reply “for what it’s worth” – I just started my bullet journal in June. I don’t use my Bullet Journal for church notes, Bible lessons, “daily pages” journaling, or art… One reason is that I tend to write a LOT when taking notes and doodle…I’d rather keep that separate. [But I have summarized conference notes into what I learned – the high points – and written them into a couple of pages.] I’ve kept a “daily pages” journal for years that’s quite personal and didn’t want to carry that around. Before I started, I read a ton of info on Pinterest and YouTube and thought about what I needed for work and for personal – it’s mostly a to do list, stuff to buy or remember, info I need to remember for work or home, appointments. I have some customized pages for keeping track of stuff and others I abandoned after a month – my spending log didn’t make it through the first month! 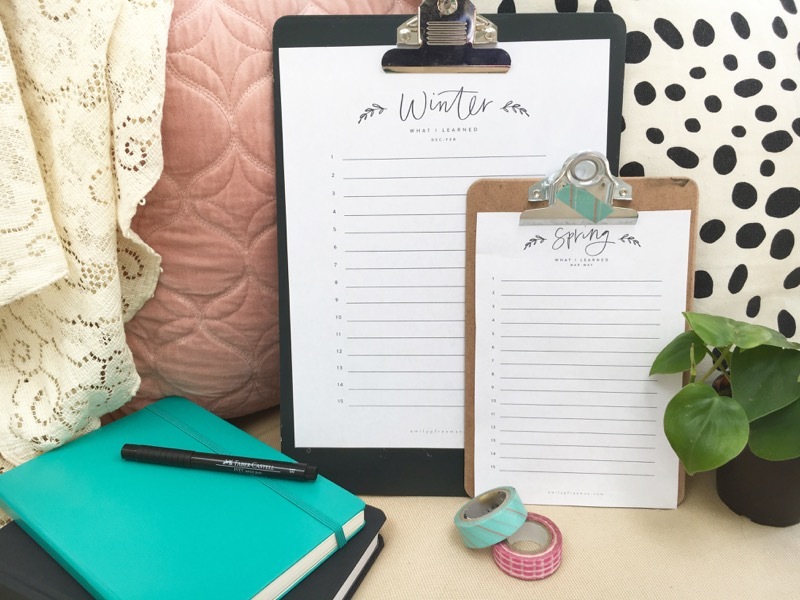 Personally, I don’t feel a need to keep track of my moods or the weather…I like that I can take a few pages to list details for special projects, ideas, etc. Hope this was helpful! This is a beautiful concept that I hope to start using to help me be more mindful and thankful. Thank you for this and the downloads! It’s wonderful article because when I have read it briefly then after my about that is totally changed. Thanks a lot for sharing this valuable information. This is great. I recently started bullet journaling and decided I’d try to write something I’d learned every day. On my daily spread I draw a little graduation cap to remind me then at the end of the day I write that new thing I learned. I love your idea of collecting them at the end of each month! Thanks for the inspiration! I just discovered bullet journaling a couple of weeks ago, and now it is my summer project-learning the art of bullet journaling. I have high hopes that it will be my new-found way to keep track of my thoughts, my money, my schedule…my life!! I’m using a modified bullet journal (I discovered there are some things I like to have separate). As simple as it probably sounds to you, the idea of just noting things on the day they arise — and then collecting them all after the fact into a single list was eye-opening for me. I’m going to start doing that for these “things learned” (starting with “I can note information on the day it comes up, then collect it into a list later”! haha). It’s also exactly the solution I needed to tracking my children’s milestones (which, so far, have been noted primarily in my Facebook history 😛 ). 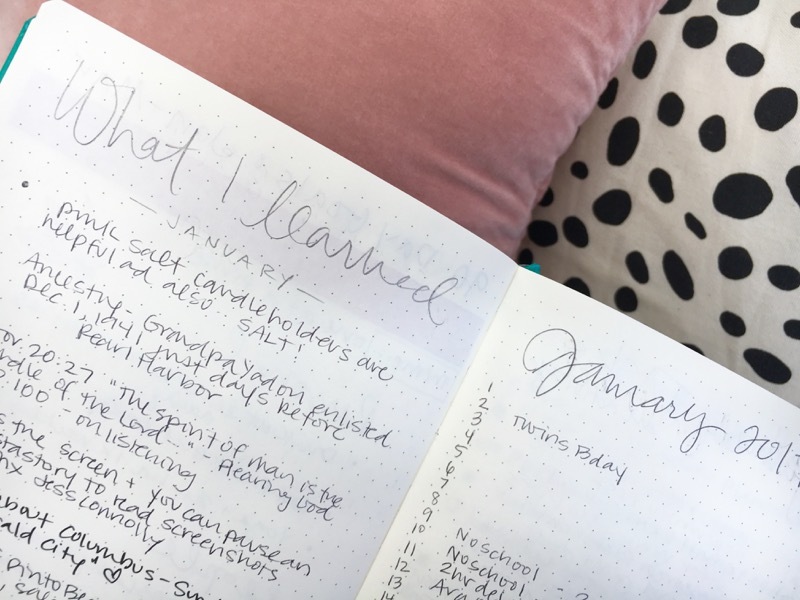 I started a bullet journal in June.. by August I had pages designed especially for what I needed but now I’m thinking about adding the “what I learned” – good tip! I use the “Peter Pauper Press” journal from Amazon… not lovely colors and not pre-numbered, but the paper is a good quality with almost no bleed-through and the price is way better than the Leuch…however that’s spelled :-). And a little washi tape across the cover makes it pretty. A LOT of washi tape and stickers inside makes it even prettier!! I don’t do the lovely drawings some do inside…I have watercolor books and sketchbooks for that…but I do a fancy cover page for each month. I’m so glad I decided to give it a try – I LOVE making lists for everything and now they are contained in one place! This is a late comment, but I’m dying to know what your favorite shoes for airplane travel are! Hello! I have entered my email a few different times, over the span of a month, and am not receiving the seasonal lists. Can you please help me :)? Thank you ever so much!! So sorry about that! We just this week discovered a bug with our delivery system and it’s being worked on as we speak. In the meantime I’ve let my assistant Traci know about your trouble and she will take care of you! I have put in my email address and checked all my folders and I am not receiving the list. I’d LOVE to add these to my bullet journal. I’m so bummed! I entered my email into the system and still haven’t gotten the lists 🙁 Any chance you could send these my way? I love this idea of seasonal learnings! I entered my email address today 4/15/19 to receive your Record what you Learn downloadable pages. As of this comment, I have not received those yet. Can you please send them to me?